CTX: In Display template CTX variable is responsible for returning the all the managed properties and other DOM elements. 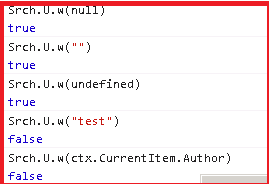 Srch.U.w(str): Indicates whether the given string is null, undefined, or empty. Srch.U.n(str): Indicates whether the given object is null or undefined. 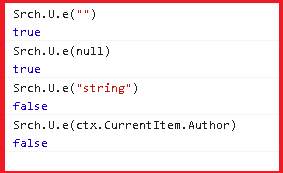 Srch.U.e(str): Indicates whether the string is null or empty. Srch.U.getArray(property): Splits the string into an array of strings using the semi colon (";") as a separator. Srch.U.isArray(obj):Indicates whether the specified object is an array or not. Srch.U.isInArray(a, item): Indicates whether the specified item is in the array. Srch.U.appendArray(a, item): Appends an element to an array.